Shapeshifter Romance. This full-length novel can be read as a stand-alone.The Whitfield Rancher1.Evan2.David3.Joshua4.Adam 5.Adrian 6.Blake (Coming 11/4/2019)Mason Jane Barnhart had nothing left to live for. She was dying and there was nothing anyone could do about it. Rather than suffer a long agonizing death, she wanted it to be on her terms. She’d let the icy water claim her, and if she was lucky, she wouldn’t suffer.Oliver Whitfield had been watching the girl. He couldn’t believe that anything could be so bad as to want to take her own life. But when she jumped from the bridge he had to go in after her. His tiger, bigger and stronger, would have to save her. When they got her to shore, Evan said that changing her was the only thing that would save her. Oliver didn’t want to, but he couldn’t let her die. He had a strange feeling that she was supposed to be the mate to one of his sons.Adrian wasn’t sure he was ready for a mate. The timing wasn’t right. He still had so much left to do while running for public office, and if word got out that she tried to take her own life, he’d have that scandal to deal with too. But when he caught her scent, he knew, she was his and all thoughts of not being ready for a mate fled his mind.When Mason opened her eyes, she was fit to be tied. She wasn’t supposed to be here, she was supposed to be dead. That’s what she wanted. What had those meddling Whitfields done now? If you buy a new print edition of this book (or purchased one in the past), you can buy the Kindle edition for only $0.99 (Save 83%). Print edition purchase must be sold by Amazon. Learn more. 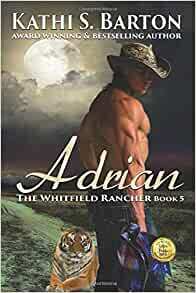 Start reading Adrian: The Whitfield Rancher - Tiger Shapeshifter Romance on your Kindle in under a minute. Adrian is on the fast track to the presidency. The new governor of Ohio, he has the backing of the President. Mason, suffered kidnapping and assault. She escaped,.was infected with a deadly disease. Worried about her father and brother she considers taking her own life. Adrian is summoned to the hospital to meet the woman whose life his father saved. Having to convert her to do it. He had a feeling that she would be his mate. Adrian and Mason are good for each other. The Whitfield family set out to find the men who kidnapped, and gave her a deadly disease. Dillon is going to make.them pay. Fast.paced and a little steamy. Loved Adrian and Mason. Can't wait for Blake and Shadow's story. I have read many of this Authors books. Almost 80%.. I look forward to seeing a new one about every 2 weeks. Lately, they are more stamped out with same narratives. The women are usually severely abused, and or children. There, the narrative is so over done, it becomes unbelievable. Also, not just this book but recent others, words are just added. At the end, she adds a little of the next book in the series and I have to go back to find out what the beginning of the next book story is. I know it all sounds bad but the redeeming is lots of magic. Would like more examples of that magic. Mason Jane has had a traumatic past. She plans to deal with it in her own way. In steps Over Whitfield to stir things up. From that beginning the swift paced story moves on dealing with Adrian’s dreams and her past. As always this is a ‘can’t put it down’ book. I’m looking forward to the next book. Another great book that I was so very disappointed to get to the end! Now I have to wait for Blake's story. So enjoy taking the journey into Ms. Barton's different worlds. 5.0 out of 5 starsWhat a great story to read! Nobody writes stories like Kathi S Barton does! When reading her work, you'll go on the journey with the characters to find happiness and true love! Mason Jane survived a living nightmare, only to have it follow her home in more ways than one. Learning of her imminent death, she decides to go out on her terms, one that, in her eyes, will spare her dad and brother the pain of watching her fade away. And then a man comes upon her and he's determined that her plan fails. Adrian is proud of his dad for saving a young woman's life, then surprised by the fact he had to change her into a tiger like them to do so. Even more shocking is when he discovers she's his mate, and then he realizes how her attempt could impact his political career...something he's immediately ashamed of when he's called out on it by one of his brothers. Adrian and Mason must adapt to the new changes in their lives, her especially as the threat of death no longer hangs over her and you know, she can shift into an animal. LOL As these two get to know one another and adjust to their new paths, obstacles occur in various forms that may end their mating before it even officially begins. One-click now and follow along as two people meet under the most unusual circumstances and discover their destiny. The teaser for the sixth and final book featuring Blake and Anna Beth (aka Shadow) has me intrigued and I look forward to their story. The tiger shifter family...the Whitfields have another brother, Adrian mated in this story. Adrian is seriously thinking of running for President. Finding his mate was something he figured would happen, but not quite yet. His new mate Mason Jane is in dire straits. Knowing she is soon to die she takes it upon herself to help things along so to speak. Ollie Whitfield gets a surprise when he saves a young girl from drowning. This mate was a bit different than the other brothers mates. She was tough like the others, and a no non-sense female to boot. There are a few surprises in this next to the last installment.....get this book and you'll see what happens!